There is quaint narrow road in Port Credit, running south from Lakeshore Road adjacent to Brueckner Rhododendron Gardens that carries the name “Godfrey’s Lane”. When travelling down this lane, one cannot help but feel transported back to a quieter time, removed from the hustle and bustle of busy thoroughfares through city today. The lane takes its name from the Honourable John Milton Godfrey (1871-1943). Godfrey was an Ontario High Court judge, and a commissioner of the Toronto Free Hospital for Consumptives (established in 1904, today known as the West Park Healthcare Centre). Godfrey also served, over time, as Ontario’s securities commissioner, and as a recruitment officer during the First World War. He served as the Chairman of the Civilian League for Recruiting, and the Vice-Chairman of the Bonne Entente movement in support of conscription. In 1913 Godfrey purchased land on the west side of Port Credit and built a house on a bluff overlooking Lake Ontario. The laneway, now known as Godfrey’s Lane, connected the house to Lakeshore Road. Prior to 1953 the lane was known as “Lorne Road”, and is illustrated as such on fire insurance maps. The road was likely renamed to avoid confusion with the nearby Lorne Park Road. The 1913 Blue Book directory indicate that Godfrey called his house “The Cove” initially, and after 1921 the “Ardmore” was given to house – the name has an Irish origin meaning “Great Height”, likely in reference to the house being built on the bluff overlooking the lake. Godfrey was married to Lily (nee Connon), and the couple had three sons who served in the First World War: Captain William Godfrey, Wing Commander John Morrow Godfrey, and Pilot Officer Thomas Robinette Godfrey. Thomas was killed in action, and his name appears on the Port Credit Cenotaph. 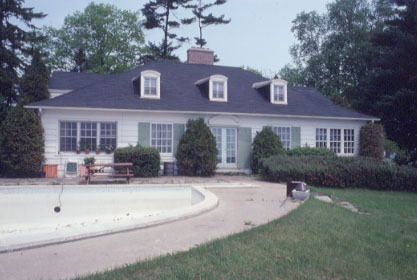 Ardmore was demolished in 1981 and the property became part of Cranberry Cove park (now known as Brueckner Rhododendron Gardens). Only the name of laneway recalls the one-time residence of the Honourable John Milton Godfrey.